In the photo below, Tom shows great edges carving into the snow. But let's see if we can help him get his upper body into a better alignment. Why? Because it will make his next turn easier, that's why. Notice the yellow line in the above photo? that sorta defines the pitch of the slope he is skiing on. See those purple lines? They mark the tipping of his shoulders and hips into the hill. It's called leaning or inclining. It's not very efficient because he can't maximize the amount of weight he can put on his outside ski. And he has to untip himself to make the next turn and that takes time. On this particular hill, it's not much of a problem: it's not that steep and Tom clearly has a grip on his edges. But if he wants to handle steeps or ice, it will help if he brings his shoulders and hips into a closer alignment with the slope. In other words, he ought to try matching his hips and shoulders to the slope of the hill. When this happens, he can make efficient use of the spring theory that I wrote about in a previous blog. 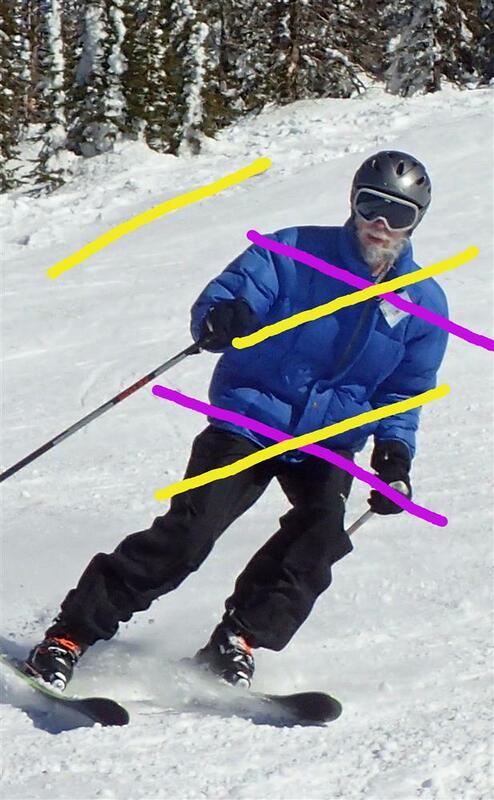 It's easy to do: push his inside hip up the hill and the purple lines will begin to match the yellow one. And if he tries to reach down the slope with his outside leg, he'll also get a better match. One other way for him to fix this alignment issue is to think about matching the zipper on his jacket with the trees on the side of the slope. That's shown in the photo below. The yellow line on the trees shows how they sit alongside the slope; the yellow line on his jacket shows where his zipper ought to be. And that green arrow shows that grippey thing: push that hip up the hill! Easy Peasy!